I love carrot cake cookies from Writer's Stop at Disney's Hollywood Studios. 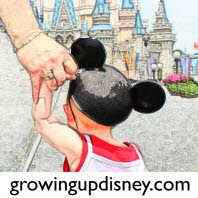 The Growing Up Disney family first discovered them a few years back and they have been a "must do" for us ever since. We even hosted a meet at Writer's Stop and had a great time sharing cookies and conversation. If you haven't tried one yet, this confection consists of yummy cream cheese icing sandwiched between two huge carrot cake cookies. Definitely a treat to share with a couple of friends or tuck in your bag to finish later. I have a great recipe for cheesecake cookies that I have shared here before. It makes delicious cookies, is really easy and is simple to vary since it it is based on a cake mix. One day I had the idea to try to recreate Writer's Stop carrot cake cookies at home using this recipe. Truth be told, I was also annoyed with myself that I hadn't thought of it before. I picked up a Duncan Hines cake mix and icing. Yes, you could make the icing yourself but I wanted to keep this quick and simple. You know, the kind of thing you could make on a Friday night when you wish you were heading off to the parks the next morning. This cake mix includes dried carrots and raisins. They add a nice touch to the finished cookies. I'd recommend busting out the mixer for this recipe, carrot cake version or not. It makes a dough that is too dense to mix by hand. I make considerably smaller cookies than they do at WDW. A cookie scoop makes this process much faster and less messy. If your dough is too sticky, pop it in the fridge for a few minutes. The finished product. My mom says she prefers the flavor of this cookie over Disney's. Let me know what you think when you make them yourself. Measure one cup very hot tap water in a glass measuring cup. Soak carrot/raisin mixture for 5 minutes and then drain well, reserving the liquid. Set aside to cool. Blend first four ingredients. (Use a mixer for this recipe. It makes a dense dough.) Gradually add cake mix, carrot/raisin mixture, and one to two tablespoons of the reserved soaking liquid. Drop by the spoonful onto ungreased cookie sheet. Bake for 10-12 minutes at 350. Don't let them get too brown. Cool for 3 minutes on cookie sheet and then transfer to a rack to cool completely. Makes 3-4 dozen cookies. Add a dollop of cream cheese icing to a cookie and top with another to make a sandwich. Enjoy! Amy made these for our visit last week and they are absolutely wonderful. Everybit as good, if not better, than Writer's Stop as these were still warm when I had Amy's.